They're found all over in Asia. They swarm the bustling streets of Bangkok, New Delhi and Beijing. 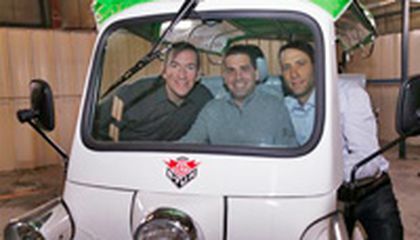 Now, a company that manufactures the tuk-tuk aims to make inroads in the United States. What's a tuk-tuk? It's the three-wheeled motorized rickshaw that has moved the masses for more than half a century in Asia. The Tuk Tuk Factory is based in Holland's Amsterdam. It has signed a licensing agreement with Denver-based eTuk USA to allow the company to manufacture and sell an electric version of the vehicle. The company's founders hope the eco-friendly vehicles will become the next hip mode of transportation for urban dwellers and tourists across the country. These versions are a far cry from the loud, pollution-spewing versions common in Asia and South America. It's too soon to know if Americans will embrace tuk-tuks. But Michael Fox, director of sales and marketing for eTuk USA, says the company has been selling the vehicles across the country. They have gone to individuals, marketing companies and food vendors. The cost is between $16,950 and $25,000, depending on how they are customized. The three partners' other company, eTuk Denver, launched a call-and-demand shuttle service in downtown Denver after receiving approval from the Colorado Public Utilities Commission. The commission regulates for-hire transportation services. The service is the latest entrant into an increasingly crowded field of transportation options. It includes pedicabs, car-sharing services such as Uber and Lyft and golf-cart taxis. 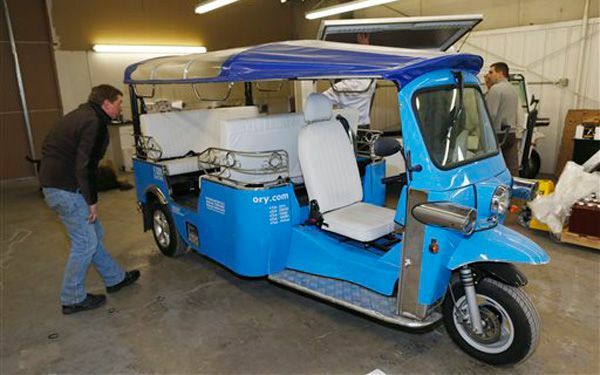 Fox is banking that the tuk-tuk's open-air design will help it stand out. "When you look at a golf cart and you look at a tuk-tuk, which has more curb appeal?" he asked. But like car-sharing services, the tuk-tuk has faced some pushback from a handful of cab companies and other shuttle operators. It has also raised concerns about the vehicles' safety. Terry Bote, a utilities commission spokesman, said several cab and shuttle companies were successful in restricting the tuk-tuks. Those restrictions include where they can operate, what types and how many vehicles can be used and how many passengers each vehicle can carry. The tuk-tuks operate mostly in a restricted downtown area. They are banned from providing scheduled service to the nearby Broncos' football stadium, a lucrative destination for the competition. But even with the restrictions, Fox said his service can complement Denver's bus and light rail systems. He noted the "last-mile concept." It's a term that has been used by urban planners to describe the difficulty of getting people from places like a railway station or a bus depot to their final destination. The concept originally applied to suburban areas. It also is relevant when studying how people complete their trips in downtown areas, said Carolyn McAndrews. She is an assistant professor of design and planning at the University of Colorado-Denver. "Everybody has the last-mile problem. And they solve that problem by walking or we drive our cars," she said. McAndrews also said the market is ripe for new modes of transportation like tuk-tuks to close that gap. She points to a 2012 study in New Jersey. It says "last-mile" shuttles are playing an increasingly important role in connecting people and jobs to rail transit. That is especially true because of the decentralization of jobs and homes in most cities over the past few decades. "To be competitive with cars, you have to make the point-to-point as convenient as possible," she said. It seems like Colorado's legislature agrees. Tuk-tuks are classified as motorcycles by the U.S. Department of Transportation. Drivers would have had to wear eye protection and get a motorcycle endorsement for the license. Anyone under 18 also would have had to wear a helmet. But state Rep. Paul Rosenthal said such requirements for vehicles that travel short distances at low speeds don't make sense. He says that's especially true for a shuttle service. "Say you have four kids. They would have to go find a helmet or have them on hand to do that," he said. "It becomes cumbersome." Still, most states heavily regulate three-wheeled vehicles. That is because of what some say is the potential for serious accidents. Sherry Williams, who chairs a committee of independent researchers on motorcycle safety, said helmets should be required. She believes passengers need to be aware of the possible danger in the event of an accident, even at slow speeds. "Most motorcycle accidents occur under 30 mph and many of them are fatal. This is a serious issue," she said. Critical thinking challenge: What characteristics of the tuk-tuk make it a good fit for crowded cities?